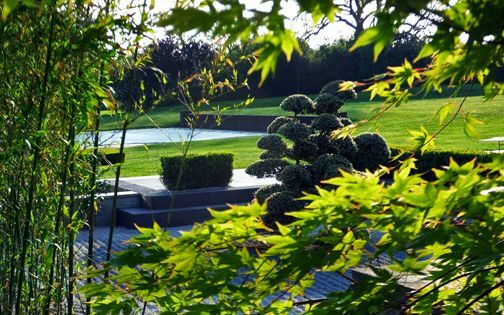 We designed the landscape gardens of this country residence over several years, and it was time to focus attention on another sizeable corner. 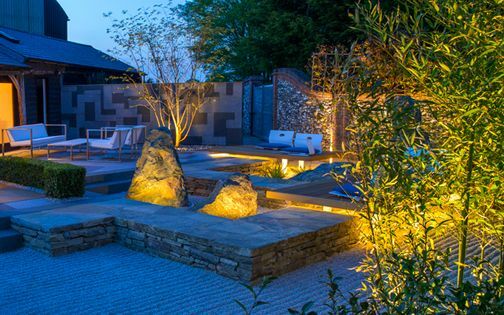 The enclosed space is blessed with mellow sunsets, sheltered by outbuildings, and since its setting was initially flat and unusable, we lowered the original topography to create a sunken rock garden. 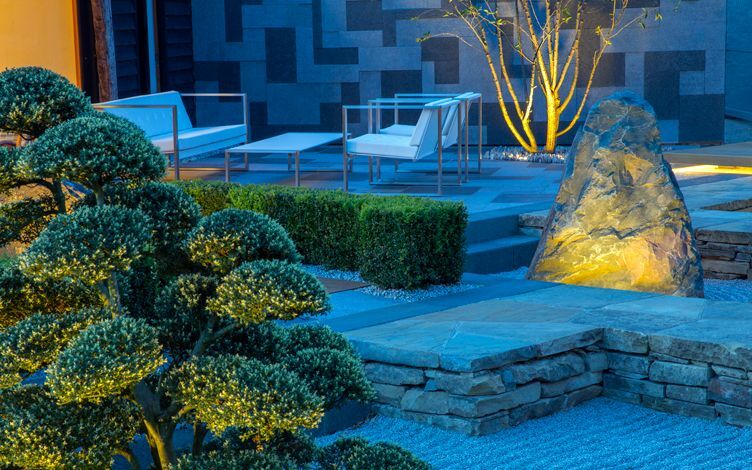 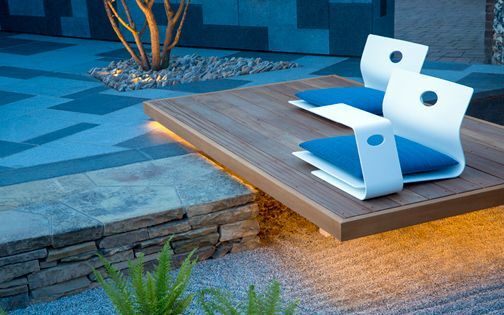 Our client advocated a contemporary approach in adapting this spot into a Japanese-inspired landscape, and with easy access, we craned in a myriad of hand-selected and large-scal rocks. 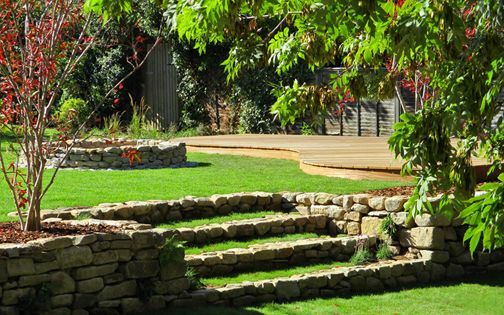 Flint walls and native trees envelop the site – producing a textured backdrop to a diverse, contemporary landscape design. 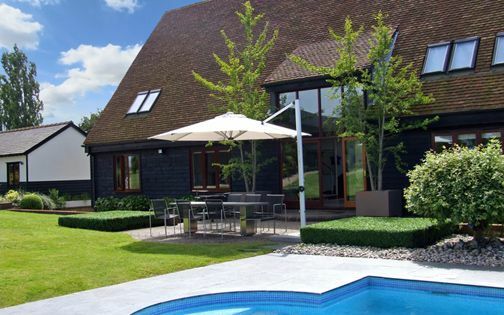 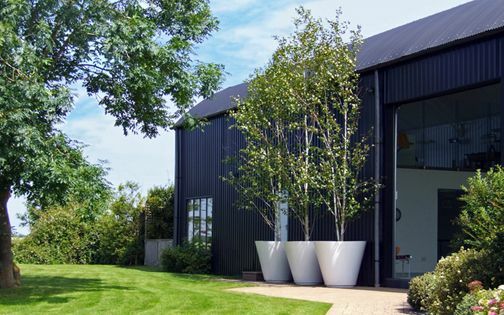 This expansive Essex barn conversion is nestled within a 5-hectare site, surrounded by picturesque fields. 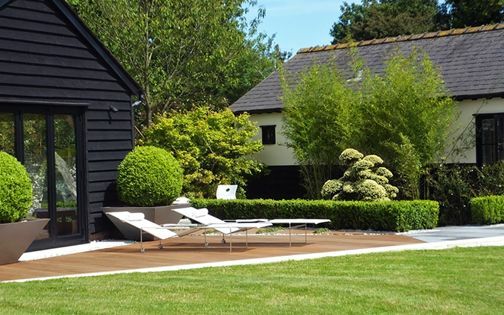 With half-dozen outbuildings dotted around the landscape, its sunken garden is sited between a guests' annexe and a car shed; west-facing, the aspect soaks up rich balmy sunsets. 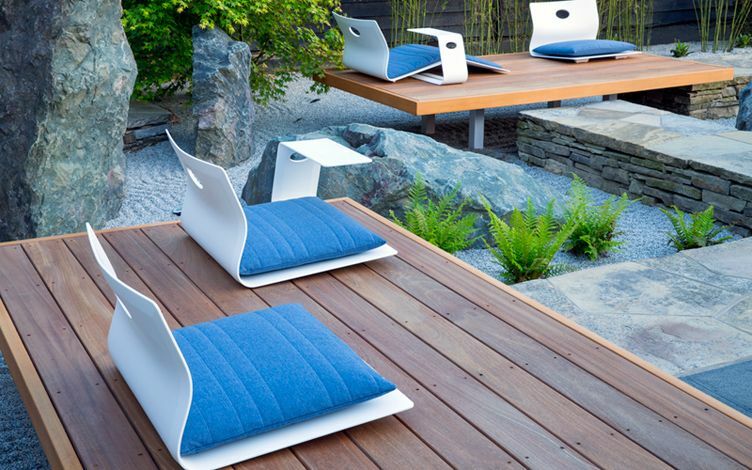 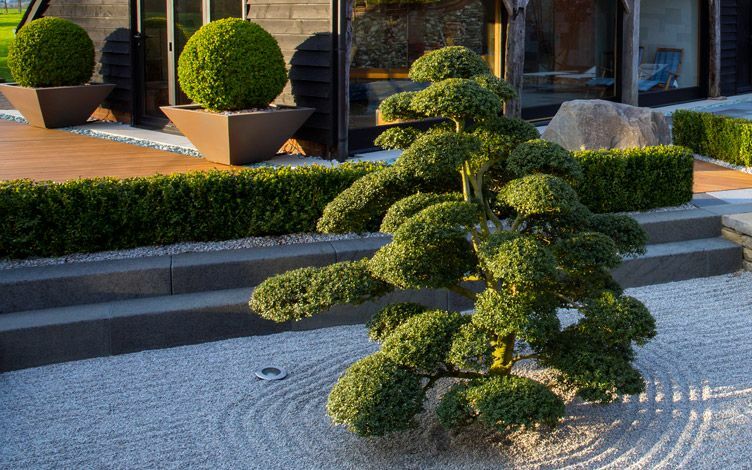 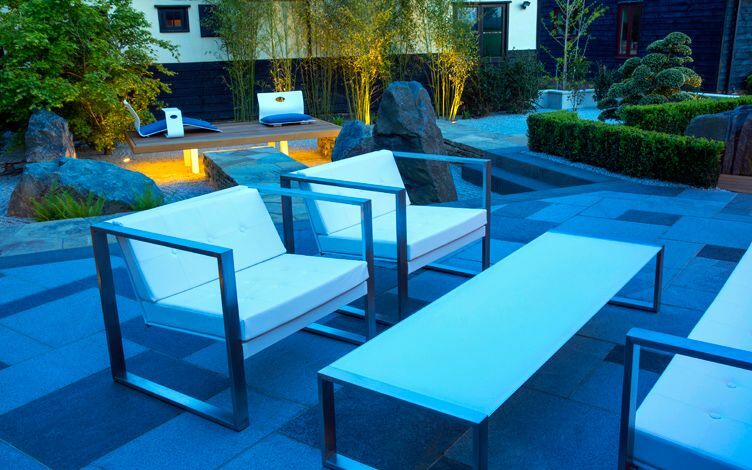 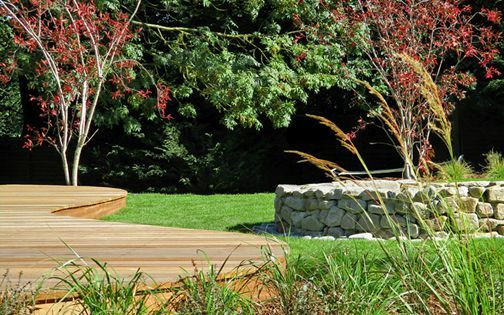 When our client returned from a visit in Japan, he'd asked if we could transform an unused corner into a contemporary Japanese garden, and as the area isn't seen from the residence, it seemed fitting to maximise this space. 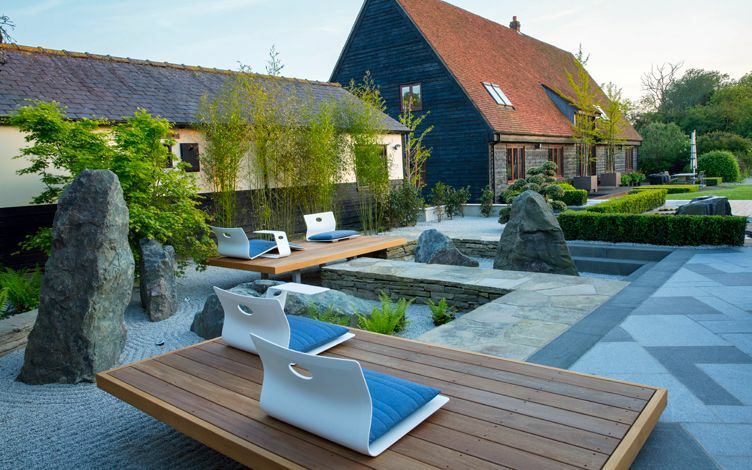 With ample access, we craned stone, rocks and large trees to narrate our design & build concept. 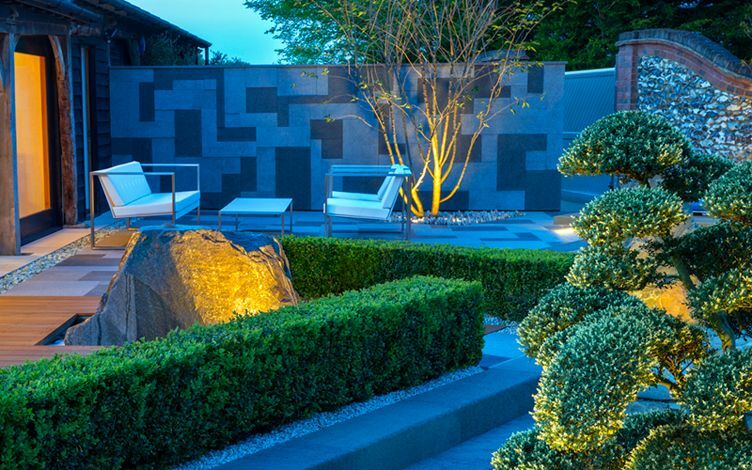 A sequence of six granite rocks meanders a diagonal axis, traversing a landscape of floating decks, gravel and slim hedges; decreasing in height, the ridge culminates where its ultimate rock forms a natural waterfall. 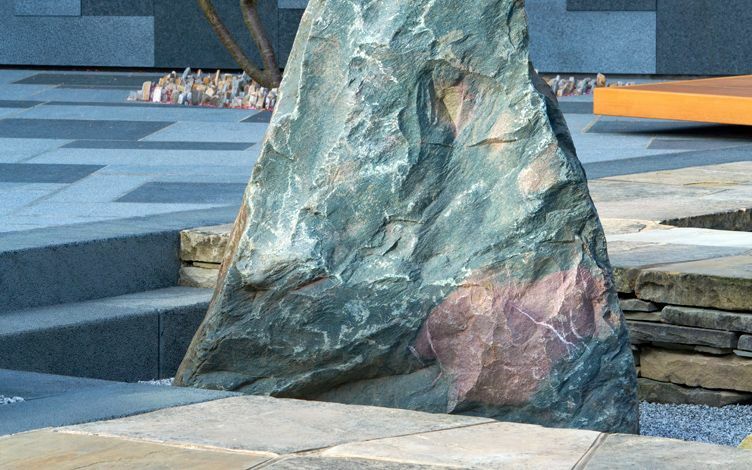 The surface narrative includes a palette of flamed, grey and black granites, producing alternating random shapes and sizes, while recycled stacked Yorkstone walls form elevated paths towards seating zones, contrasted by new sandstone along the perimeter. 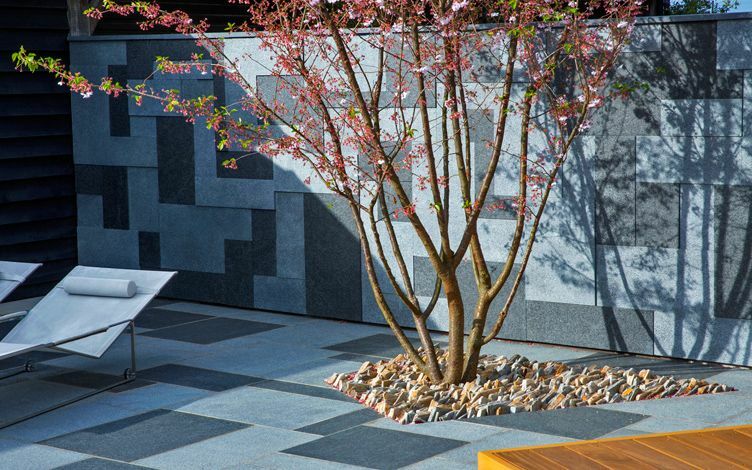 Solid basalt blocks create linear steps into a sunken garden, where modified level changes enhance spatial depth – generating a low-key ambience. 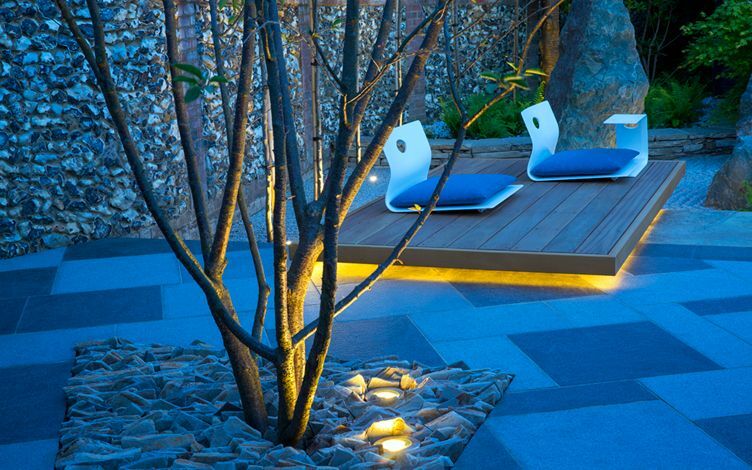 Bamboo, Camellia, Ferns, Ginkgo, grasses, Holly, Magnolia and Maple are layered in varied scale to infuse an Eastern essence. 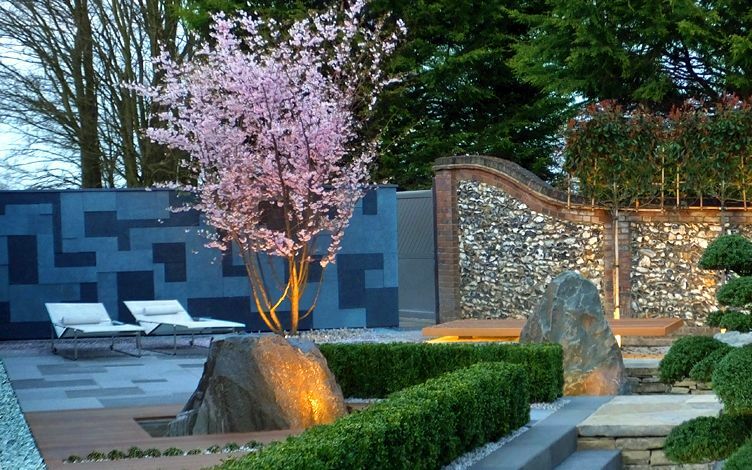 A multi stem Cherry tree provides a graceful focal point by the seating area, amid a contemporary stone wall backdrop. 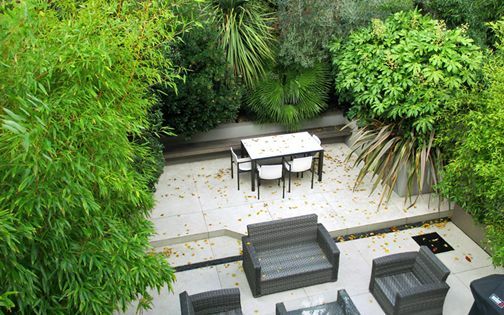 Low Box hedges define the space, sustaining architectural partitions which articulate the overall layout. 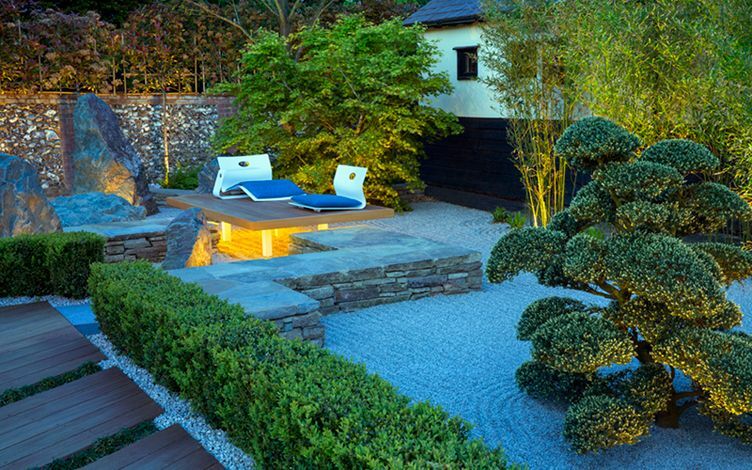 A sculptural Japanese Holly cloud tree, reminiscent of ancient temple gardens, anchors the sunken area, while balancing the composition. 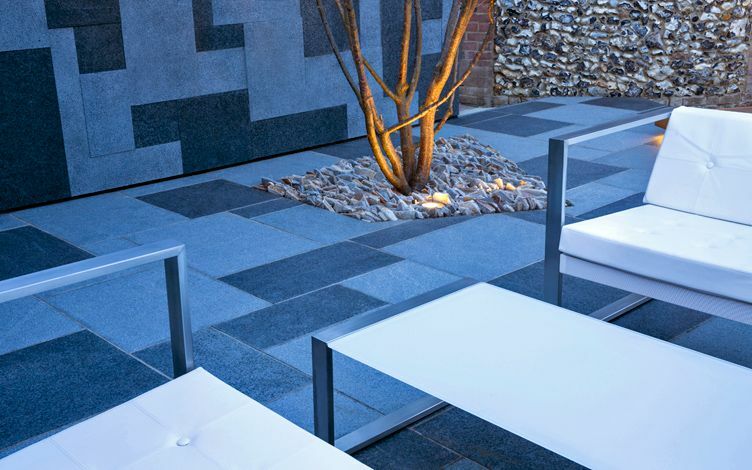 Pebbles and cobbles in varying sizes, colours and finishes produce a refined detail design interlayer throughout this extensive scheme. 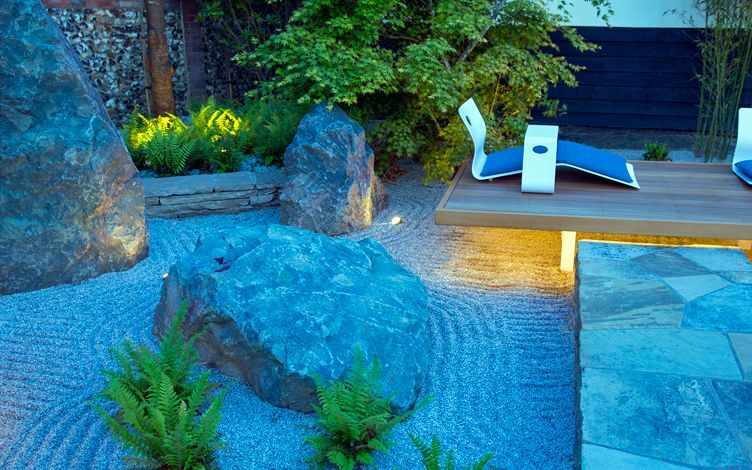 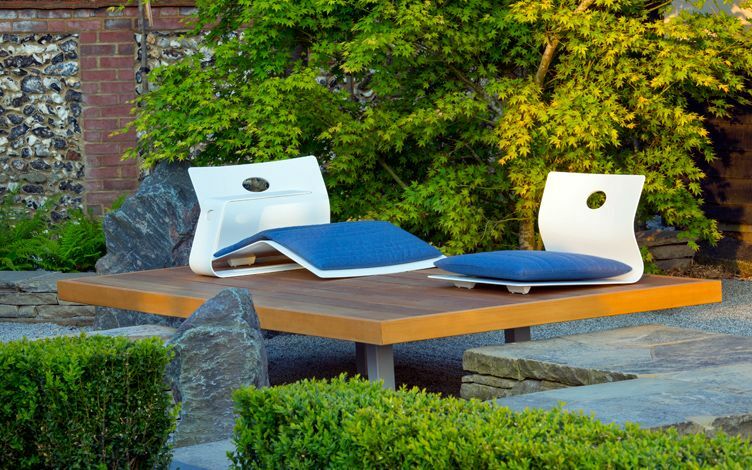 Our client returned from the Far East with a yearning for a Japanese landscape vignette in his own back garden. 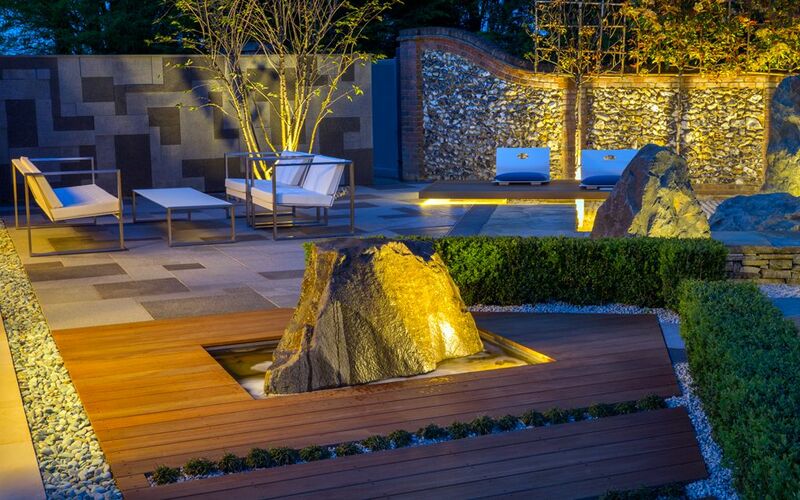 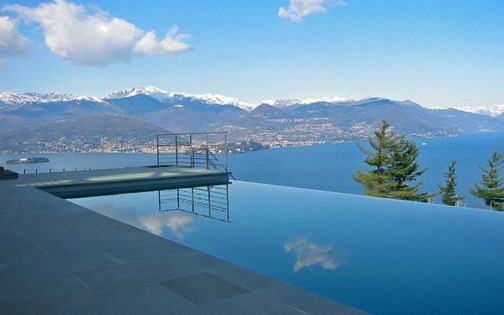 Meticulously hand-picked Cherry trees, natural stone and rock formations articulate a modern layout, defining clarity via allegorical landscape design ideas, where the team's resourceful stonemasonry extends our grasp of a symbolic landscape within a contemporary repertoire. 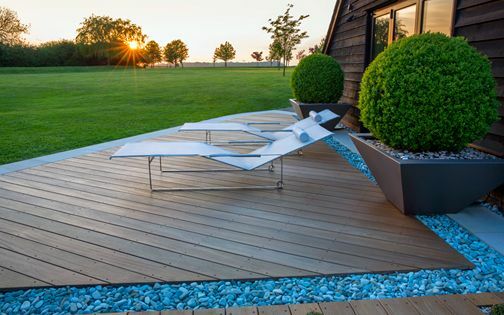 We enjoyed collaborating with an inspiriting client in producing this well-integrated blueprint, which nurtured a unique design process – augmented by the owner's aspirations and vision. 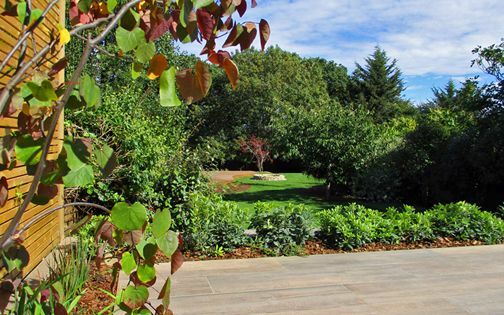 The secluded garden space gained distinctive character, relished in exclusive privacy, where family and guests perch to gaze at the setting sun, amid highly embracive garden landscaping.